We teach you how to live inside your body. To feel your feet when they strike the ground and know which way you need to turn your foot in order to align your body and work toward being pain-free. It allows you to be conscious in your body while instinctively bringing awareness to your life. Your mind and body have connected. We see this automatically benefit the lives of our clients by helping them make decisions that are in the best interests of their health from choosing better foods to choosing a career that suits them better. A clearer mind helps you to expend less energy everyday and use that energy towards a life you love. 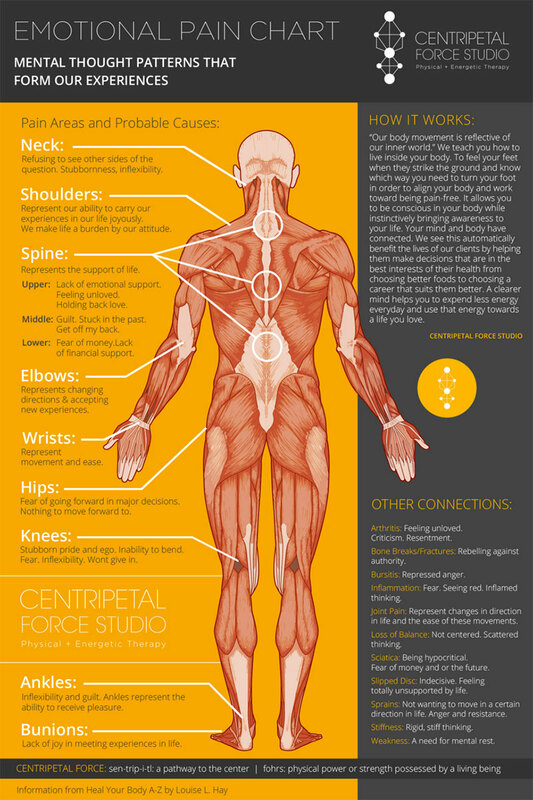 Our emotional pain chart breaks down all of your physical maladies and helps you attribute them to the root cause. Every single person who comes through our door has connected with this emotional pain chart and used it as a starting point to really dive into their depression, unsteadiness, or whatever it may be. It’s incredible how, when the mind and body connect, our clients become visibly and quickly transformed. We see this automatically benefit their lives and it’s from something very simple—we’re helping them make decisions that are in their best interests for health, whether they’re choosing better foods or choosing a career that better suits them. DOWNLOAD HIGH RESOLUTION EMOTIONAL PAIN CHART. Archetypal patterning shines a light on the purpose and meaning of your life. Archetypes are deep unconscious patterns within us that make us who we are as individuals. They drive our motivations, beliefs, values, emotions and behavior. Acting like a mirror, archetypes can help you see and understand the underlying reasons for the patterns in your life, even the ones involved with your pain. Each archetype has both its strengths and weaknesses. When you are aware of your archetypes and understand your typical ways of behaving and relating, you can capitalize upon those strengths and guard against the archetype's weaknesses (your underdeveloped traits). The more you function within the strengths of your inherent archetype, the stronger and more confident you will become, the more control you have over your life, and the better prepared you are to make the choices that create the life you want free of pain. This process is great direction for anyone that is "stuck", in need of meaning in their life, understand the root cause of their chronic pain/illness/disease or just want to get to know themselves a little more. 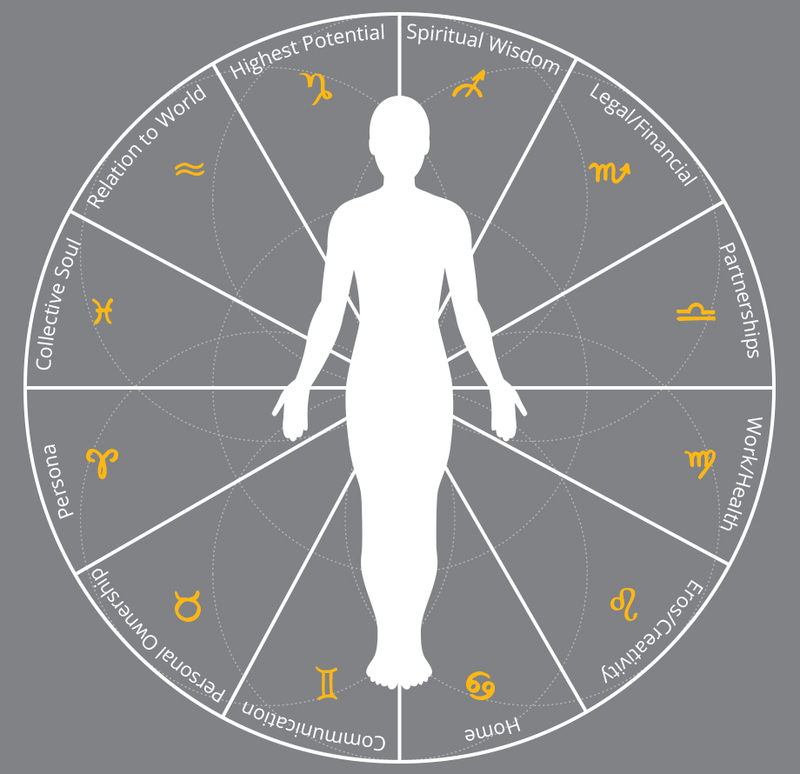 By determining your archetypes that are most active in your psyche it will help lead you to achieve greater insights into your life. We all have survival archetypes. They're the energy guides within our bodies that, combined with our personal nature and nurture, help to develop and power us in to who we are. Archetypes are psychological patterns derived from historical roles in life, and even though they are historical and universal, they become personal when they are part of your own psyche. Our biography becomes our biology. Identifying your individual archetypes can be a challenge as you evaluate and analyze your experiences and relationships, but the payoff is invaluable. We're here to help you do that. Craniosacral Therapy (CST) is a gentle, hands-on method of evaluating and enhancing the functioning of a physiological body system called the craniosacral system - comprised of the membranes and cerebrospinal fluid that surround and protect the brain and spinal cord. Using a soft touch to the skull, spine and pelvis, practitioners release restrictions and blockages to improve the body's natural rhythm and restore vibrant health to the central nervous system. The treatment will leave you feeling relaxed and connected. CST is used as a preventive health measure for its ability to bolster resistance to disease. It is effective for a wide range of medical problems associated with pain and dysfunction, such as headaches/migraines, chronic neck & back pain, chronic fatigue and many others. Pranic Healing is a form of energy therapy that utilizes prana (life-force) to balance, harmonize and transform the body's energy processes. The no-touch healing technique is based on the fundamental principles that the body is a self-repairing living entity that possesses the ability to heal itself by using natural elements to address physical and emotional imbalances. The treatment will leave you feeling cleansed and centered. Reiki is a Japanese healing technique that focuses on activating the natural processes of the body and restore physical and emotional well-being. The light hands-on touch is based on the idea that an unseen "life force energy" flows through us and is what causes us to be alive. If one's "life force energy" is low, then we are more likely to get sick or feel stress, and if it is high, we are more capable of being happy and healthy. The treatment will leave you feeling peaceful and rejuvenated. A supportive mentor who helps our clients make healthy lifestyle choices whether the goal is to lose weight, increase energy or sleep better at night. Your Health Coach will motivate you to make lasting changes and feel your best. In addition to eating, health coaches address all the facets of health— relationships, career, exercise and spirituality— thereby helping people become healthier and happier in all areas of their life.